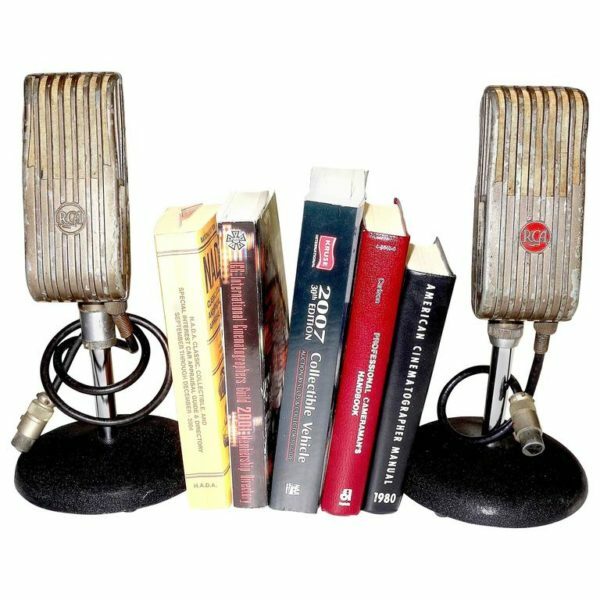 For your consideration is this circa 1945 PAIR of RCA 6203-B Varacoustic Microphones. Much authentic patina from over 70 years of studio and broadcast use. Not restored or changed from original as found condition. Mic stands are more recent than the mics. Reportedly used at the University of Alabama by Coach Bear Bryant in the Football Teams Radio Broadcast Dept. University of Alabama metal inventory labels still affixed on each microphone. “Roll Tide” heritage. Offered as a beautiful deco style pair of bookends or bookshelf old tech curios or for other sculpture display venues. The mics are complete and do work but not to professional studio standards. The books shown are not included but are for photographic display only. 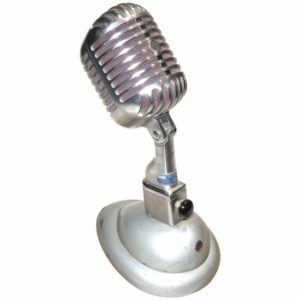 Typically these sought after vintage mics, in a bit better shape, sell for $1500.00 to $2,200.00 or more each. Hard to find ‘relics’. Offered as a wonderful display sculpture artifact for home or office or library or in a collection. 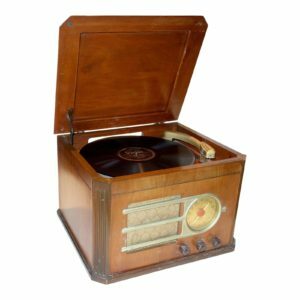 A true vintage RCA Art Deco audio artifact. Shown price is for BOTH microphones and stands. Display books not included.